Remove the dough and separate into individual biscuits. Open each one. Sprinkle 1 half of the biscuit with some of the mozzarella cheese and top with a meatball. Cover the meatball with more cheese and close the sandwich with the other half of the biscuit. Use your hands to close the biscuits, making sure there are no holes in the dough to keep the filling in. Sprinkle the biscuits with garlic salt. Arrange the stuffed biscuits on a baking sheet and bake for about 20 minutes. Serve with marinara sauce and finely chopped parsley. Use frozen meatballs to save time, but you can also use homemade meatballs. Add other ingredients to the filling, such as red peppers or mushrooms, to give the dish even more flavor. These stuffed biscuits are a real time saver when I’m asked to bring something to share at school meetings or when friends drop by with little warning. That’s why I always keep a few packages of biscuit dough on hand, along with a big bag of frozen meatballs. I try to add all the cheese I can to each serving. My mouth waters just thinking about the stringy, gooey melted cheese enjoyed in each bite. Although the basic ingredients used in the filling are meatballs and cheese, you can use your imagination and add any or all of your favorite ingredients. 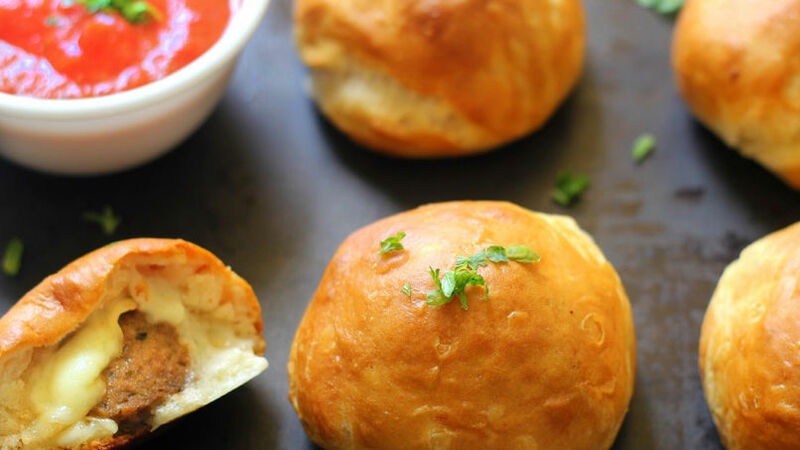 What would you add to these meatball biscuits to make them your own?